The July blockbuster that sent Rick Nash to New York was viewed by most of the hockey world as an overwhelming victory for the Rangers. For Columbus, it appeared to be another disappointing chapter in what would turn out to be the final months of the Scott Howson saga. That was before Howson was replaced and the once lowly Blue Jackets clawed their way up from dead last and into the playoff picture. In spite of the experts and the absence of their longtime captain, Columbus is competitive. In the interest of keeping competitive, in the waning minutes prior to April’s trade deadline, Columbus and New York were at it again. This time around the reactions favor new Columbus GM Jarmo Kekäläinen. In fact, the latest trade between the Blueshirts and the Blue Jackets has fans wondering; did perennial bottomfeeder Columbus fleece the Bigwigs from Broadway? A real answer won’t be known for years down the line, but since Gaborik’s arrival the Blue Jackets run has evolved from improbable to nearly unstoppable. The results of the deals will provide plenty of history between Columbus and their soon-to-be division rivals for years to come. 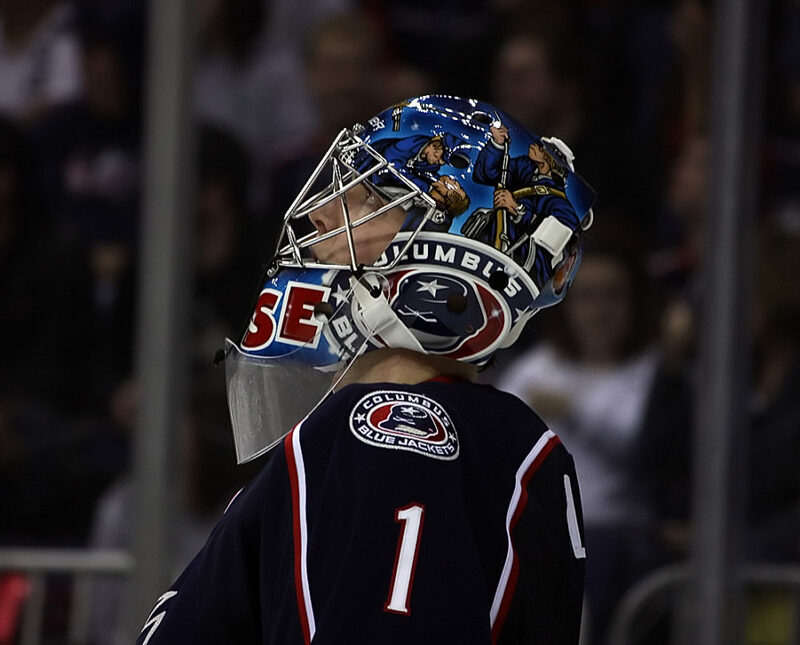 Next season Columbus will trade juggernauts in Chicago and Detroit for a division filled with familiar faces. The realignment puts Columbus in a unique position to prove they moved the right guys by competing directly against them. On the other hand, defeat at the hands of Columbus castoffs would be a nightmare for fans and the front office. Let’s look ahead at the “ex’s” the Blue Jackets will battle for the division crown in 2013-14. And you thought they’d never make a sequel to Ghosts of Girlfriends Past. Jakub Voracek is one of the most dynamic weapons on the Flyers offense. That’s great news for Voracek, but not so much for Philadelphia’s lackluster attack. Voracek is first on the team in goals and powerplay goals and a mere point behind team leader Claude Giroux. While it’s unlikely he’ll lead the likes Claude Giroux and Wayne Simmonds in production again next year Voracek has blossomed into a bonafide, if unrefined, playmaker in Philadelphia. If Jakub Voracek is to become a consistent threat for the Flyers, he’ll need to improve on a shaky -10 plus/minus. Voracek is young, talented, and exciting. If that wasn’t enough to make Jackets fans miss him, remembering how Columbus lost him sure will. In return for Voracek and the seventh overall pick in the 2011 Entry Draft, which turned into promising forward Sean Couturier, Columbus was granted a tumultuous half-season relationship with disgruntled diva forward Jeff Carter. Carter was shipped to the eventual Stanley Cup champs in Los Angeles at last season’s deadline. Jack Johnson and the Kings 2013 first rounder are decent concession prizes, but given the chance to do it over again good luck finding a fan in Columbus that would pull the trigger on Jeff Carter. Then again, you could say the same for practically every move former GM Scott Howson made prior to acquiring Sergei Bobrovsky. Steve Mason burst onto the scene in Columbus with a Calder Trophy-winning effort that landed the Blue Jackets into the playoffs for the first time in franchise history. It’s been four long years since that playoff appearance and Mason hasn’t been nearly as good since. You can practically pinpoint his collapse to that very post season series against the Red Wings. A veteran Detroit team, as savvy a playoff club as there is, dismantled Columbus. Mason, the team’s backbone that whole season, was blown up by a Detroit team determined to prove to their Central Division little brother did not belong in their dance. 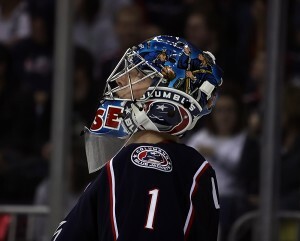 They proved their point and ruined a promising young goaltender’s confidence in the process. Mason has been a shell of his former self since that disheartening series. Goaltending requires strong mental discipline and Mason has fallen into a lengthy rut from which most goalies don’t return. Big and athletic, there’s a chance he could come back to haunt the Jackets, but right now Columbus must be looking forward to the chance to face Mason a couple times a year. Detroit and Chicago certainly seemed to enjoy it. The fact that Columbus received anything in return for Steve Mason was a miracle. Mason’s welcome was long worn out. The only regret might come from Scott Howson, who may have cost himself a job by betting on the troubled netminder in his final full season as GM. John Moore is a solid hockey player with a long future in the NHL. He is not, however, a gamebreaker or true top line defenseman. Moore may one day prove Columbus wrong, but his currently play was no better than Dalton Prout, the Jackets sixth round selection in the 2010 draft. Moore was a first rounder in 2010. In addition to Dubinsky, Anisimov, and a first round pick the Blue Jackets landed defenseman Tim Erixon in exchange for Rick Nash. Erixon was the 23rd overall selection in 2009, two picks after John Moore. The Columbus front office was plenty comfortable letting Moore go with Erixon on the roster as they have shown similar promise and share nearly identical draft pedigrees. With Erixon, the emergence of Prout, and highly-touted prospect Ryan Murray likely joining the team next year, the defense is loaded for years to come. John Moore would have been fighting for a spot on the depth chart, so it’s best for all parties he has moved on. This one may sting. Brassard has been playing well since joining the Rangers. He’s been a big help in New York’s push for locking down one of the East’s final playoff spots. Brassard, like Moore, scored in his first game with the Blue Shirts. If he’s developed a chip on his shoulder, Brassard has the potential to be dangerous with the right talent around him. Regret for the Jackets goes way up if Gaborik opts to play elsewhere at the end of his contract. His arrival in Columbus has been as good for the team as it has for Gabby’s production which was sorely missed in New York for most of the season. Brassard is still something of an unknown quantity. 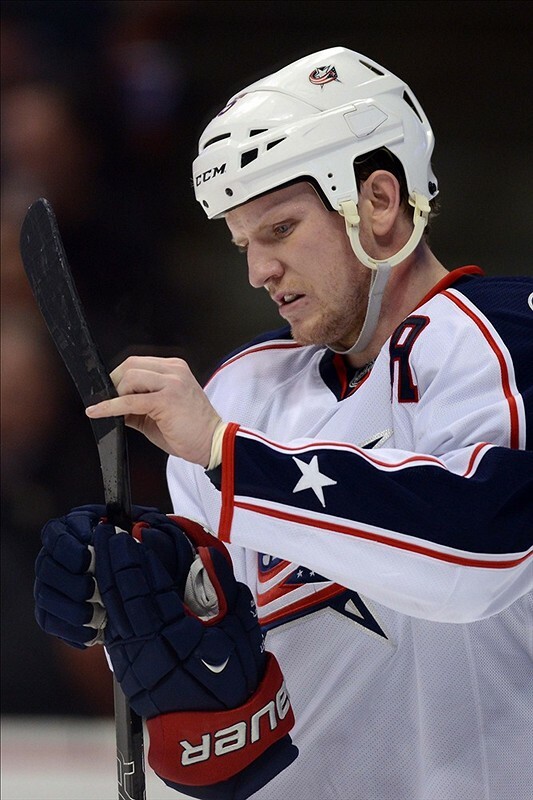 While he’s shown up in flashes Columbus has plenty of rising offensive potential in Boone Jenner (who has four points in five AHL appearances this season), Ryan Johansen, Cam Atkinson, and Matt Calvert. Not to mention those three first rounders in June. Assuming Gaborik signs long term, Brassard would have to develop into a superstar to make the Jackets feel any serious remorse. Derek Dorsett will be missed. His aggressive attitude and tendency to drop the gloves made him a mainstay in the penalty and the hearts of the Cannon faithful. No player has shed more blood in the name of defending Nationwide Arena and, for that, Dorsett will not soon be forgotten. The first time he drops the gloves against the Blue Jackets will be an emotional fight to say the least. Dorsett was promptly replaced by Blake Comeau via a deal with Calgary in the final furious minutes the deadline. Not known for scoring, the gritty Comeau has notched a pair of key goals since arriving in Columbus. The Jackets got themselves in the playoff discussion with hustle and ferocity yet Dorsett’s absence has not made this team any softer or slower. 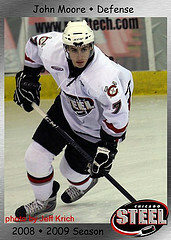 Besides, it gives Jared Boll the opportunity to take on all comers as the team’s primary bruiser. 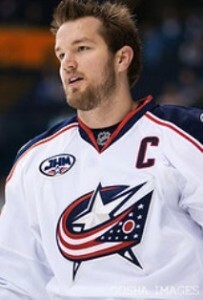 The Jackets courted many suitors for Rick Nash. They could have sent him to Detroit or San Jose or Los Angeles, but New York was most appealing for one big reason. And it wasn’t Artem Anisimov. By sending Nash to the Big Apple, and in doing so the Eastern Conference, Columbus would avoid facing their longtime captain in any frequent or relevant capacity. Then came the realignment and, suddenly, the most famous face in Blue Jackers history is about to become their greatest divisional foe. Nash is playing one of his best seasons in his first season for the Rangers and he’s done it in spite of his underachieving teammates. He can, and will, only get better for New York as they build around him like Columbus never could. For Jacket Backers, losing Nash was like breaking up with a longtime girlfriend. It was painful, both sides said some things they didn’t mean, and a surreal emptiness was all that was left when the dust finally settled. Following the disaster that was last season, Nash had finally grown tired of failed attempts to rebuild around him. 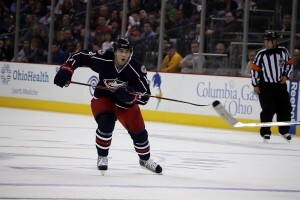 Columbus can’t regret losing Nash too much as the separation was inevitable. Like most break ups, as much as it hurt to admit, both sides were better off apart. Following the initial trade, many felt Scott Howson didn’t get enough for Nash. Now, if you consider the two blockbusters as one big deal, it’s hard not to give the Jackets the upper hand. Rick Nash is a younger, more complete player than Gaborik who makes up for his size with explosive speed and a deadly wrister. Erixon for Moore is wash at this point. Anisimov and Dubinsky have been much more productive for Columbus than Brassard and Dorsett were. On top of it all, Columbus essentially then gives up a sixth rounder for a first. A feat only possible thanks to smooth negotiating by Jarmo and Gabby’s hefty contract. No doubt Jackets fans will miss some of their former players, especially the beloved number 61, but the on-ice returns and future potential outweigh the losses. Even in a year where they’ve played themselves out of a decent lottery pick June offers more excitement than ever with three selections in the first round. Columbus will no doubt develop heated rivalries with their cast-offs, but if their improbable playoff run is any indication of what the Jackets will bring to the East next season former Jackets best prepare for a much different team than they remember.